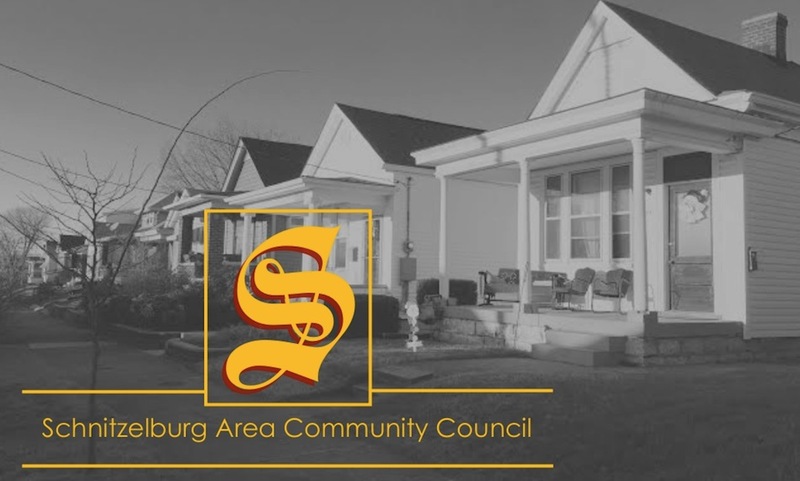 The SACC has decided to start 2014 off fresh with a new meeting location in an old building you've probably passed dozens of times in Schnitzelburg. 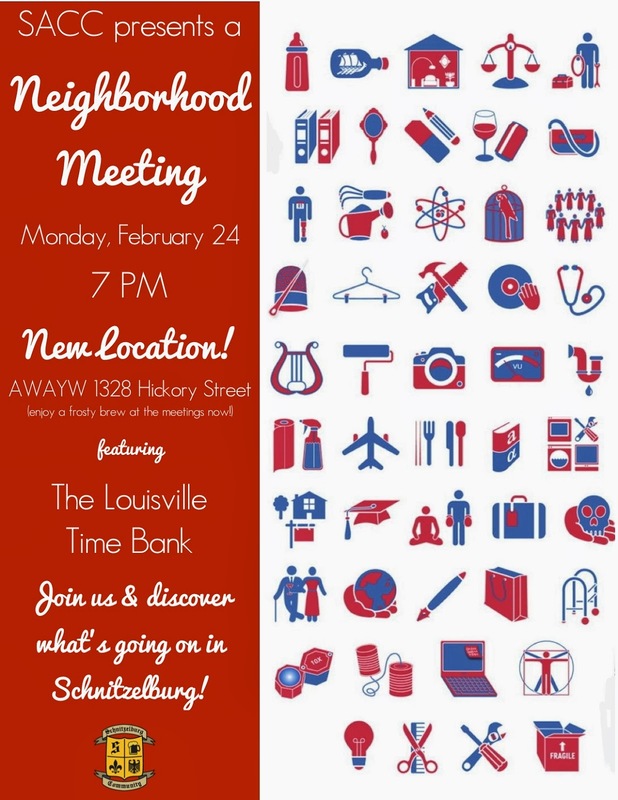 Rather than heading to St. Elizabeth's for the February 24th SACC general meeting, neighbors will be directed to the All Wool and a Yard Wide Democratic Club at the corner of Hickory and Ash Streets (1328 Hickory). The SACC has worked out an agreement with the democratic club to share their infrequently used space. One of the biggest appeals of the new location is a more intimate space for SACC meetings. St. E's is a gracious host, but their basement cafeteria was a bit too expansive and had acoustics that made it difficult to hear speakers. And no, you don't have to be a democrat to come to our meetings - everyone is welcome! The new space is large enough to hold our largest meeting numbers, yet still maintain that intimate feel we are going for. The building is a shotgun, so it is considerably longer than it is wide. The ground floor is one large room with tables and chairs in the bulk of the space with a bar and bathrooms in the rear. You should now be able to hear speakers more clearly and engage with your neighbors more easily. There are two exterior entrances for the club, both blue doors. The door on the Hickory side of the street opens to the large meeting area and the one at the back, accessible through the bier garten, opens to the bar area (you will now have the option to enjoy a frosty beer during the meeting!). Both doors will be unlocked during the meeting. The decor inside is a little dated - wood paneled walls and a hodgepodge of pictures of democrats - giving it a feel of a time capsule that was buried with JFK. Where is lacks in contemporary design, it charms with character. With time and a little TLC the SACC hopes to breathe new life into the space, but preserve its rich history. The building started off as the Herbig's Grocery in the 1800's, selling dry goods and also acting as a saloon. According to the book Louisville's Germantown and Schnitzelburg (written by SACC board member and local historian, Lisa Pisterman), the All Wool and a Yard Wide Democratic Club was founded around 1900 and "formed by woolen mill workers and named for the 'all wool' and 'yard wide' woolen goods produced at the nearby [cotton] mill." The All Wool and a Yard Wide remains one of the few democratic clubs in Louisville that owns its own building, which is a feat in a time when democratic clubs have gone by the wayside. 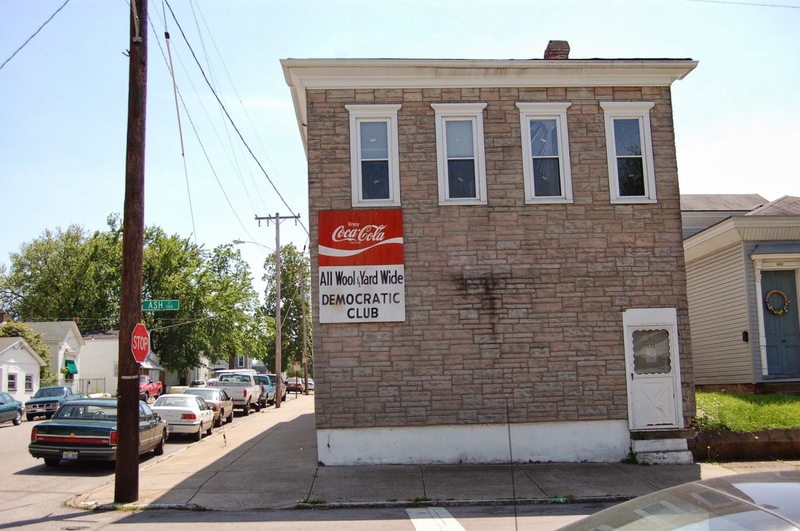 This week, the Keswick Democratic Club (1127 Logan Street) was put up for sale. We hope a great investor scoops up the building so it doesn't end up like the abandoned and run-down Germantown Democratic Club (907 Goss Avenue). 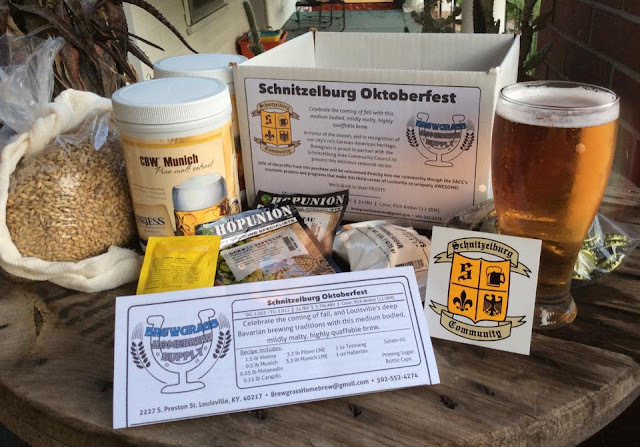 Currently, All Wool and a Yard Wide uses the space for monthly meetings, an annual fish fry, and a party during the spring and fall Schnitzelburg walks. The space is also used periodically for Kentucky Young Democrat meetings and is available for rental year-round. The second story of the building is rented out as residential space. One of the disadvantages is the loss of St. E's large parking lot. Now, meeting attendees will need to find street parking along Hickory or Ash Streets. There is typically a plethora of parking on Hickory. There are a couple of handicapped spots directly outside the door on Hickory and we are able to assist anyone with a disability into the building. We really hope to see you at the meeting on February 24th, even if your curiosity is the driving force. We are super excited about the new meeting space and resuming general meetings after a lengthy winter break. We will have our LMPD resource officer on hand to give us an update on the neighborhood, some prospective local politicians to shake your hand, and Kara Underwood with the Louisville TimeBank will be our featured speaker. The Louisville TimeBank is an extension of TimeBank USA whose mission is "to nurture and expand a movement that promotes equality and builds caring community economies through inclusive exchange of time and talent." Basically, a TimeBank is group of individuals who barter their time and services to one another for a mutual benefit. With the aid of technology, communities are now able to grow and support each other with a disconnect from monetary motives. Kara will talk about how the TimeBank operates and how you can get involved. Click here to view a great segment by ABC News on the Louisville TimeBank. Wow! That picture is really too old but what is surprising is the actual space is being greatly preserve. I would like to have a meeting in a place like that. I'm glad you shared this one.